SPEEDWAY, Ind. (May 24, 2017) – The anticipation is building for Oriol Servia and Palm Beach Driving Club for Sunday’s 101st running of the Indianapolis 500. Servia, who is sporting a Palm Beach Driving Club logo on his helmet, will start the race in 12th position after qualifying with a four-lap average speed of 230.309 mph around the famed 2.5-mile Indianapolis Motor Speedway. It will be his ninth start in the world’s largest single-day sporting event. The team suffered an engine malfunction with the No. 16 Rahal Letterman Lanigan Honda during Tuesday’s practice. But, Servia believes he is still in good shape for Sunday’s race. 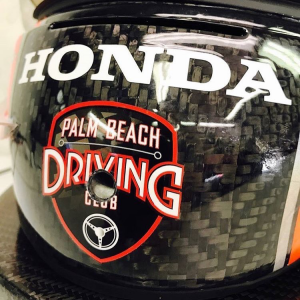 The members of Palm Beach Driving Club have a genuine rooting interest with Servia wearing a PBDC logo on his helmet for a second straight year. Servia, who has a best finish of fourth in the Indy 500, finished 12th in the historic 100th running of the race in 2016. 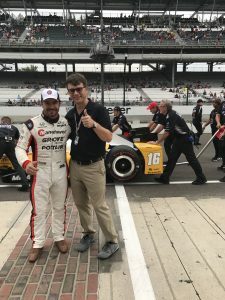 Palm Beach Driving Club Managing Director Paul Jones was in Indianapolis this past weekend and saw Servia’s enthusiasm first hand. He also saw why the Indianapolis Motor Speedway is such hallowed ground in the world of racing. Palm Beach Driving Club is the pre-eminent members-only club for automotive enthusiasts in the United States, and is located at Palm Beach International Raceway in Jupiter, Florida. The 101st running of the Indianapolis 500 is set for May 28, with coverage beginning at 11 a.m. EDT on ABC, and the Indianapolis Motor Speedway radio network. For more information about PBDC, please go to RacePBDC.com.